While in desperate search for ramen in San Diego, I discovered this place via Yelp. The decor and interior is nothing like any ramen place I’ve been to before. Its very open, modern, and stylish. I ordered the Underbelly ramen which came with egg, chasu, bacon, and sausage? While the noodles were a bit overcooked for my taste, the broth was legit. A bit salty, but legit. The meat is where I got confused. Bacon? and Sausage? In my opinion, it doesn’t mix well with the broth and ramen. The sausage literally tasted like a hot dog, out of the 3 people in my group that got the Underbelly ramen, none of us actually finished or enjoyed the sausage/bacon. 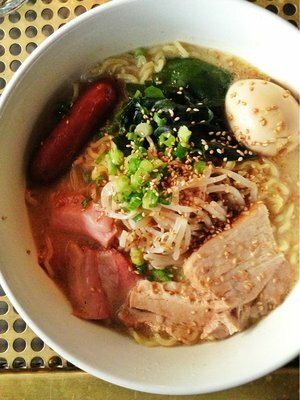 Since Yamadaya and Santouka are in San Diego as well, I’d recommend people visit those locations for a more legit ramen experience.